Published comments and links to news stories are made available on this blog as a service by the AAUP - UI chapter to provide context and enrich the discussion of core issues, including academic freedom, shared governance, professional values, and standards for higher education. Opinions expressed herein do not necessarily represent the views of the AAUP UI chapter or AAUP - National. Visitors may view and/or subscribe to official statements, press releases, and announcements on the chapter's main homepage (www.aaup-uiowa.org). 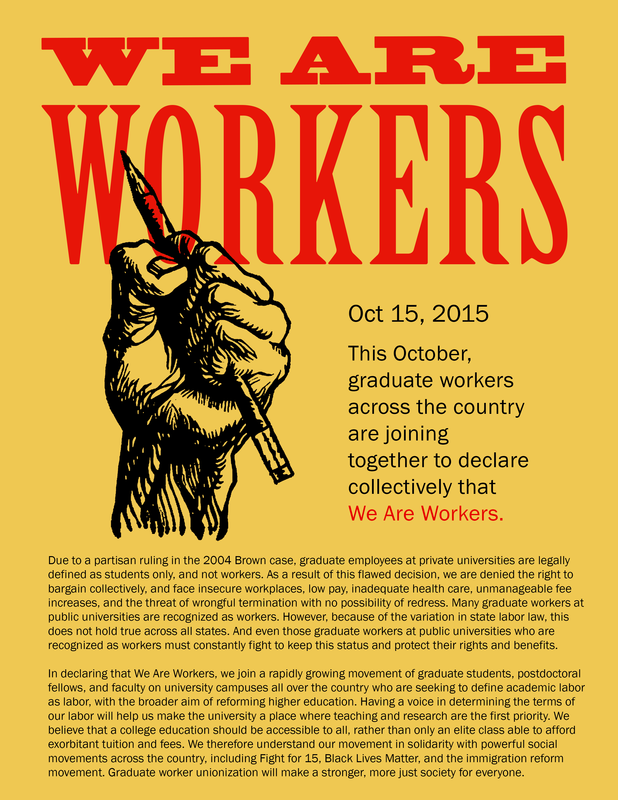 The AAUP Committee on Graduate and Professional Students issued a statement in support of a graduate employee solidarity day of action that will take place on Thursday, October 15, 2015 at universities throughout the country. The AAUP stands firmly behind graduate employees as they stand up in defense of their right to form unions and bargain collectively with their employees. For more information about the day of action and the #WeAreWorkers social media campaign, visit https://weareworkersblog.wordpress.com/. Read the full statement of the AAUP Committee on Graduate and Professional Students below or download a .pdf file of the statement. On Thursday, October 15, 2015 graduate employees at universities throughout the country are standing up in defense of their right to form unions and bargain collectively with their employers. The American Association of University Professors (AAUP) Committee on Graduate and Professional Students stands firmly beside these graduate workers and endorses their solidarity day of action to declare in one voice that We Are Workers. As an institution, the AAUP maintains a commitment to collective bargaining in the academy. The right to organize and form unions is crucial for fair working conditions and belongs to all who perform labor on our campuses. The AAUP promotes this right for graduate workers, at private and public universities, as evidenced in the AAUP Statement on Graduate Students (2000) and the Resolution on Graduate Employee Organizing Rights (2004). Graduate workers occupy a unique and necessary role in universities. They provide an inexpensive source of essential teaching and research labor. Unfortunately, the right of graduate workers to collectively bargain with their university free from intimidation has been under attack, even as universities rely increasingly upon grad and adjunct labor to perform essential functions in their institutions. The AAUP firmly supports graduate employees in asserting their right to organize without suffering retaliation from faculty or administrators. The Committee on Graduate and Professional Students reaffirms the message conveyed in the AAUP Resolution on Graduate Employee Organizing Rights (2004) that the National Labor Relations Board (NLRB) decision in the Brown University UAW case (2004) was wrongly decided by a partisan Board and must be overturned. Graduate workers have organized a vibrant movement throughout the academy in their fight for recognition despite the challenging contemporary legal framework in which they find themselves. The Committee commends the growing number of graduate workers, adjunct instructors, and contract faculty across the country who are organizing for better working conditions. On this #WeAreWorkers day of action, graduate workers are reclaiming their rights and standing up for principles long championed by the AAUP and the Committee on Graduate and Professional Students. We stand in solidarity with this action, with this movement, and with these graduate workers fighting for justice. What's unacceptable about the status quo at UI? The University of Iowa AAUP chapter maintains this web site. Opinions expressed by individual contributors to the site represent their personal views and are not necessarily positions of the chapter or any other entity. Opinions expressed by the chapter do not necessarily represent the views of the national AAUP or any other entity.